These pork chops are wicked good! My sister in law, Deb, is from New England and was the first person I ever heard say something was wicked good. We tease about her accent – being from the Midwest and all, WE speak with the correct accent. When Wheels and I visited, Deb told us that they would be taking us to a seafood restaurant called Newick’s. I kept looking for Newark’s – compensating for her accent. Guess what? It really did say N E W I C K on the sign. Maybe part of the accent is in the hearer’s ear! These pork chops were a surprise, too. Surprise that I ever tried them because I do not like mustard. Not as in I hate it and it would never cross my lips, but I won’t go out of my way to eat something with mustard in it. Not only did I voluntarily make this – but it has become a frequent flier recipe for pork chops cut half inch or thinner. (Thicker chops don’t let the mustard shine — do you know how badly I wanted to say “don’t cut the mustard”! — and I have another recipe for them.) I’m not sure where the recipe originally came from, as the clipping I have is missing any identifying marks. Measurements are somewhat approximate. I use whatever pork chops are on sale and adjust accordingly. I usually squirt the mustard (about a teaspoonful) on the chop and then spread it in a thin layer on one side. If there are bare spots I add another squirt. I lay that chop, mustard side down, in the plate of bread crumbs and put mustard on the other side, then roll it in bread crumbs before putting it into the already heated skillet. Brown over medium low heat to dark golden color on both sides in olive oil that barely covers the bottom of the pan. Sometimes the olive oil is absorbed and it will be necessary to add more to finish the browning. About 6-8 minutes per side is all that is required for medium chops. Use a sharp knife to open the center and visually inspect for doneness or use your thermometer to be sure the center is 140 degrees (a new guideline). About 20 minutes from start to finish. Bread crumbs can be Italian seasoned or plain with your own seasoning added. I prefer the Italian. Start with ½ cup of crumbs for four hand sized chops. Since crumbs shouldn’t be saved if they have been used to coat meats, it is better to shake out more as needed than to have a lot left. I have used Dijon mustard and the classic French’s yellow mustard, but my favorite is honey mustard. Cooking for your family is part creativity and part using what is at hand. Don’t be afraid to experiment. 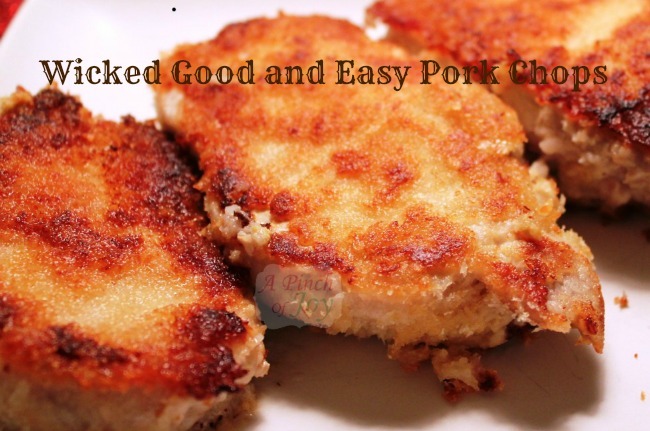 Lightly flavored with honey mustard and browned to a crisp, these Pork Chops are Wicked Good! Pour oil in large skillet to just cover bottom, preheat. Squirt a teaspoon of mustard on chop, spread to cover and put mustard side down in bread crumbs. Squirt and spread mustard on other side of chop, turn to cover with bread crumbs. Place coated chop in preheated skillet. Cook tightly covered for 5-8 minutes on low to medium heat until golden brown. Turn chops and cook for another 5-8 minutes until golden brown. Welcome to A Pinch of Joy! I hope you’ll take a minute or two to look around. Be sure to follow A Pinch of Joy so you don’t miss a thing! Follow using the icons on the teal bar at the top of the page. I’d love to have your company on this venture!! Share: if you found this helpful or inspiring please click one of the sharing buttons below! Your support of A Pinch of Joy is appreciated! this again and bake them the next time. This will also save on calories. The lid is to be sure that the temperature of the meat rises to at least 140 degrees, the current federal guideline for making sure any illness causing baddies are destroyed. Your solution of baking would work for both crisp crust and appropriate temp. You might also let the chops crisp for a couple of minutes without the lid when they are finished cooking — or cook without the lid and use a thermometer probe to be sure you reach the appropriate temp. Thanks for stopping by! These sound great. I would love a recipe for pan gravy to go with them. (I’m not a great cook and don’t really know how to make gravy.) Thanks in advance! Sorry, Tara. I told my sons that only grandmas make gravy. And that only grandma tvs got Saturday morning cartoons. They saw through that one pretty quick, but this is the first time anyone has called me on the gravy! Seriously, making gravy requires a certain amount of fat and really lean chops only need a bit of olive oil to keep them from sticking. Making gravy would probably require melting additional butter. The formula is 1 tablespoon of fat, plus one tablespoon of flour stirred together thoroughly to make a paste and then whisk in one cup of liquid (milk is often used for pan gravy, but you can use broth) and bring to a boil until it thickens. Salt and pepper to taste. For four chops, I would double the formula amounts and I’d be tempted to add a squirt or two of mustard to taste just to keep the mustard flavor going — but that’s just me! My sister has made these for as long as I can remember. She makes a “Pan gravy” with the pan drippings and serves it over hot egg noodles. That sounds like a good side dish — never thought of using noodles. Yum! A friend gave me a recipe a few years ago that I use all, and I mean ALL the time. She said it was a weight watcher’s recipe–similar to yours. I use it not only for pork chops, but boneless chicken breast, fish filets, etc. 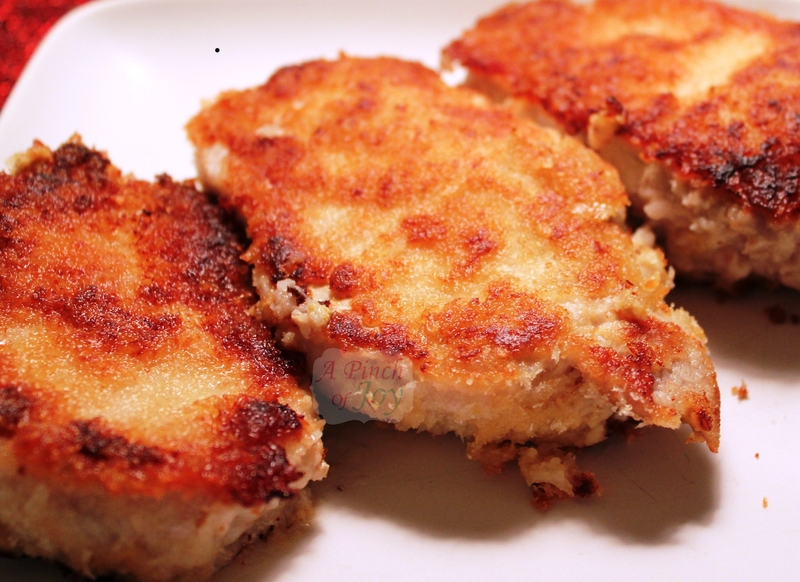 Mix mustard and olive oil, dip chops in that, then mix bread crumbs and grated parmesan and dip them into that as well. Then bake in the oven at 400 for about 20 mins (more or less depending on thickness of meat). Same principal as your recipe, just a little bit lighter! Sounds really good! I like the idea of baking the chops too. Yum! I’ve made these alot through the years! I like to pound the chops with a meat mallet a lil before breading! Enjoy! Thanks for stopping by! Using a mallet would make them more tender — will have to try that! Oh yum! These sound awesome! I’m always looking for new ways to cook pork chops. Can’t wait to try them. Yum! Thanks for sharing this – I love anything with mustard on it!